Early yesterday morning, it was so warm that I cracked open the window to enjoy the soft breeze, while still trying to catch a few more hours of sleep. As the smell of clean air began to reach me, so did the constant chirping of the birds outside. At first, they were all I could hear. But eventually their calls began to blend and fade into another layer of a lovely spring chorus. While the intermittent sound of a car going by seemed out of place, it was wonderful to hear the joyous sounds of nature. Even as I enjoy the convenience of living in a urbanized area with all it’s modern charms, I can’t help but envy those who choose homes further out of town. The appeal of a different sound, nature’s sound, often keeps the idea of moving to someplace more remote, constant in my mind…we will just have to wait and see. Since poetry is one of my favorite things, and it is my birthday, I decided to combine all three into today’s post: a poem, on my birthday, about nature. 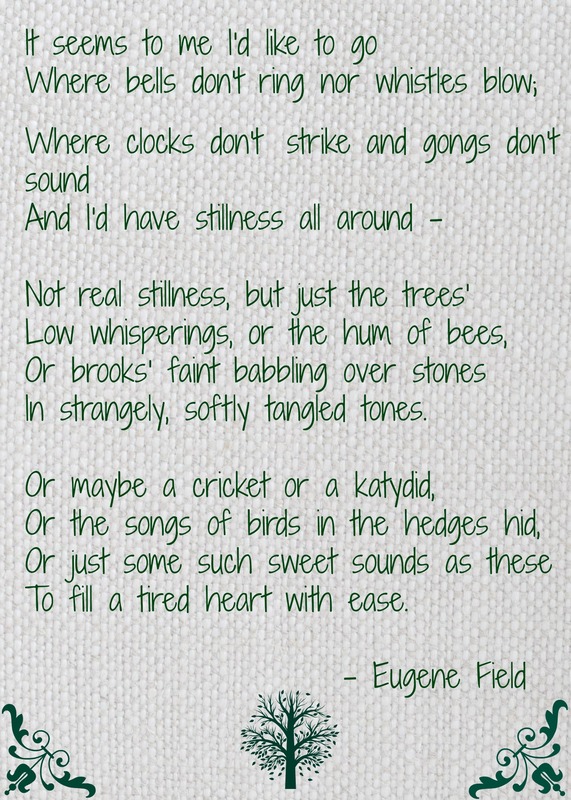 One of my favorite nature poems is by Eugene Fields, the author of Wynken, Blynken, and Nod. So on this Earth Day, take time to open the windows and let as much wonderful noise in as nature can give you! Happy birthday! May your heart be filled with ease. 🙂 This is one of my favorite poems, too. I moved from “the city” to a rural area and love it.